A) Individual adults from 18 years onwards: € 30 ..
B) Individual children up to 17 years: € 25 ..
C)	Groups of schools for a minimum of 15 participants: € 15 up to 17 years of age ..
2)	Medium 1 hour lesson / tour (Min 2 max 6 participants) which includes the details in point 1) with a longer tour than the one in point 1): € 60 each. 3)	Advanced lesson / tour from min. 2 hours ( Min. 2 max 6 participants ) which includes the details in point 1) with a much longer tour than the one in point 2) : € 120 each participant. 4)	Entire day with Dog sled and snowmobile, Min 4 max. 6 participants, from 9 am to 4 pm, € 200 each participant. 5)	Snowmobile Tour: min.1 max 6 participants, duration min. 1 hour, try the thrill of travelling on a snowmobile assisted by an Instructor with the possibility to drive it too on the trails of our School : € 80 each snowmobile. 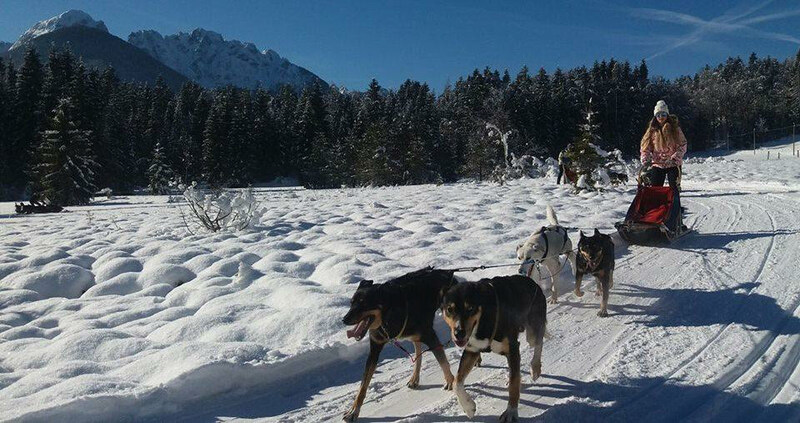 6)	Courses of 20 hours at various levels of Student Musher, Musher, Guide, Teacher, Instructor: starting respectively from € 600, 800, 1000, 1200, 1500 with release of license SIM. 7)	Adventure in Swedish Lapland, 5 days duration in March, April and May, Min.4 participants, quotation upon request. ALL RATES ARE INCLUSIVE OF INSURANCE AND ANNUAL MEMBERSHIP FEE of € 5 Euro in the first lesson ! The recommended winter clothing is the classic ski suit with a full suit, or in alternative sufficiently warm trousers and a windbreaker jacket, gloves, cap and snow boots or trekking shoes - not bulky (we do not recommend the bulky Moon Boot) - to move easily on the snow. Our headquarters are on the FUSINE Flats (Tarvisio_UD Italy) on the National Road n. 54 before the Slovenian border connecting Tarvisio to Kranijska Gora. BOOKING IS NECESSARY well in advance. For general information on hotels, restaurants, transport and other services tel. 0428/2135 (Tourist Information Agency) or 0428/2392 (Tourism Consortium). Our hours are: 9 - 12 except for pre-announced exceptions. The Responsibles: MONICA D 'ELISO & ARARAD KHATCHIKIAN the only Italian mushers (drivers of sledges and dogs!) to have participated in the most important competitions and adventures of Sleddog to the World !